I’m not sure when we stopped frequenting Kyushu, an unassuming ramen house in the Valley. Probably around the time I realized that when it comes to complex carbohydrates, I am like an alcoholic: My body cannot handle too much of them, and one sumptuous taste will set me off on an eating binge that does not stop until I’ve consumed an entire box of cooked pasta. Pasta is probably my biggest downfall, although I am also partial to artisan bread, roasted potatoes, and rice. Surprisingly, I am pretty resistant to sweets — other than dark chocolate. And it’s hard not to crave ice cream on a hot summer day. As you can see, even writing about carbs puts me into a tailspin. But if you are ever looking for good, inexpensive eats in the San Fernando Valley, I feel it is my duty to let you in on the secret. It’s actually a public service. But I will make this brief, if only for my own self-preservation. We’ve been experiencing another cold snap here in Southern California, but that’s not what caused our expedition to Kyushu. It actually began with a rare Friday evening where all three of us sat down to watch Netflix together. My daughter has become a real fan of indie films, and she selected The Ramen Girl, an obscure Japanese/American flick starring Brittany Murphy, which was released the year before her sudden and untimely death. In the movie, Murphy plays Abby, a young American who has moved to Tokyo to be with her boyfriend, only to learn he didn’t want her there, after all. Lonely and alone, she finds refuge and redemption in a neighborhood ramen shop. Chicken noodle soup has always been one of my comfort foods, and I think there may be something universal about that. There is a scene in the film where a mere bite of tender noodles put a smile on the patrons’ faces, even bringing some of them to laughter. There is another scene where customer’s sample Abby’s own first attempt at making broth and are brought to tears. The idea that a cook’s emotions are imparted into his or her food is not new. The movie was very sweet and a pleasant way to spend 90 minutes. But it had a very deleterious side effect: I wanted ramen. In fact, I could not rest until I had some. And my daughter was in the mood, too. It had been so long since we visited Kyushu Ramen that I wasn’t certain of its exact location on Sherman Way (for the record, it is just west of Sepulveda Boulevard). It had been so long since we visited that Megan had no recollection of ever being there, although we did drop in fairly often when she was little. The food is good and inexpensive, and it was a favorite of our friends Maggie and Junior, who never steer us wrong when it comes to food – especially Japanese food. Once Megan heard that Kyushu was “Junior-approved,” she knew that this place would be the real deal. And it is. 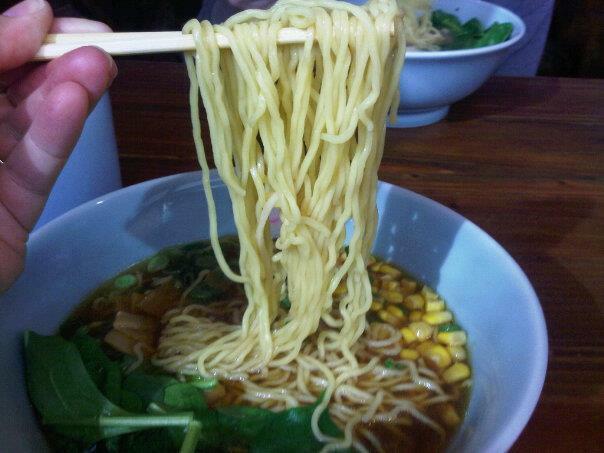 I ordered the basic Shoyu Ramen for $6.95: a steaming bowl of broth and noodles, garnished with spinach, corn, bamboo shoots, spring onions, fish cake and a slab of tender pork. I laughed when I saw the corn, because in the movie we watched on Friday, the ramen master has a fit when Abby suggests adding corn to her dish. I guess it’s not traditional but OK? At any rate: It was just what I needed to satisfy my craving. If only I had stopped at the ramen! Kyushu has a rather large menu, and I could not resist ordering some gyoza to go with my soup. Megan had fried rice along with her miso ramen; she ended up bringing half of it home and re-heating it last night for dinner. I wish I had been so restrained; I ate every dumpling on my plate and I think I could have easily downed more. I gained two pounds from that one ramen lunch and need to go carbo-cold turkey again – especially after writing this, because I’m craving more ramen. Kyushu Ramen is located at 15355 Sherman Way, Van Nuys, CA 91406. I was not commissioned or compensated for this post.